Less Than Reality: Do You Viggle? Have you heard of Viggle? If you like reality TV, you really should know about it! 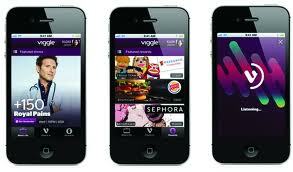 Viggle is an iPhone and Android app that gives you points just for watching TV. The points add up and you can cash them in for stuff like gift cards, an iPod and a Kindle Fire. Essentially, you can take home free stuff just for watching TV! All you have to do to use Viggle is download the app and choose your TV provide from Viggle's list. Then, aim your phone at your TV as you watch a show, and use Viggle to check in. Viggle will recognize what you're watching, and you get points for the shows you watch. Viggle has contests and other interactive activities, like the MyGuy interactive sports challenge. You watch sports and play along with Viggle, which adds a whole new element to the game. Plus, if you're a DirecTV customer, you can link your accounts and earn a TON of extra points. This app is great for everyone, but if you've got DirecTV, it's definitely a bonus. Why do I like Viggle? I like Viggle because it's fun! I love finding out how many points I earn for each show that I watch. Plus, I watch shows anyway, so I might as well benefit from my reality TV habit! I spent hours watching HGTV this weekend (hello, House Hunters!) and the points added up really fast. It will take a while before you have enough points to cash in, but when you do cash them in, it's totally worth it.